Date Formed: Organized December 24, 1908. CITIES: Denhoff*, Goodrich, Herr*, Lincoln Valley*, Martin, McClusky, Pickardville. 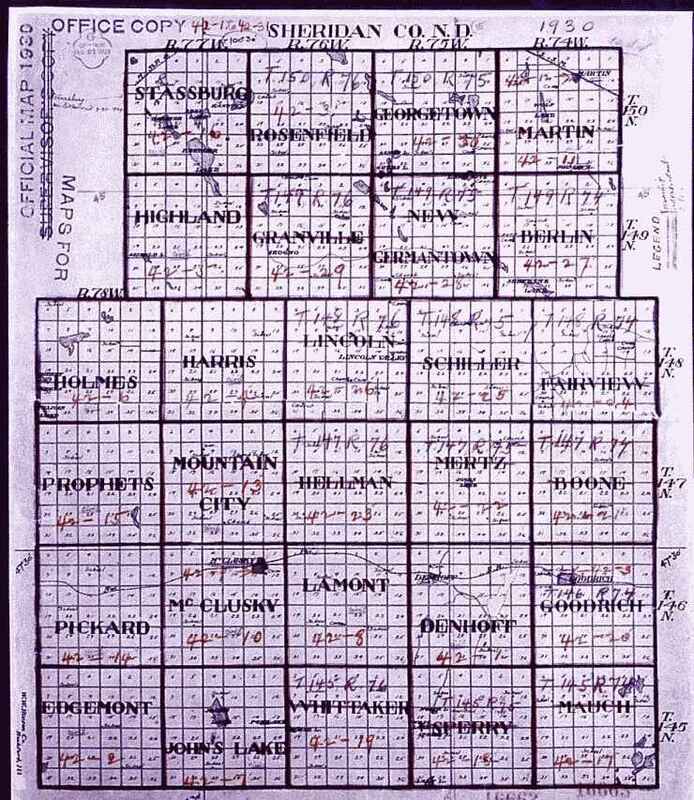 TOWNSHIPS - [1930 Map]: Berlin, Boone, Denhoff, Edgemont, Fairview, Georgetown, Goodrich, Grandville. Harris, Hellman, Highland, Holmes, John's Lake, Lamont, Lincoln Dale, McClusky, Martin, Mauch, Mertz, Mountain City, New Germantown, Pickard, Prophets, Rosenfield, Schiller, Sperry, Strassburg, Whittaker. Kassel Reformed Church. 75th Anniversary Kassel Reformed church, Lincoln Valley, North Dakota 1900-1975. Standard atlas of Sheridan Co., North Dakota by Van Valkenburgh Map & Litho. Co.